on this Blog, scroll down to the bottom of this page to: Friends & Links & scroll down to: Linear B TTF & click on it to download. 1. Whenever you switch from your default Latin font (Times New Roman, Georgia etc. ), you will have to change your font size to 26 or 28 points BOLD, if you wish the Linear B text to appear large enough on your keyboard to be easily legible. If you choose anything less than 26 points, some Linear B characters may not display correctly, usually with some strokes missing. 2. Once you have switched to Linear B font, you can use the keyboard guide in the previous post to type Linear B characters (vowels, syllabograms, homophones & logograms) or words, phrases and sentences. With the guide and the Linear B Font install, you will even be able type the entire text of most extant Linear B tablets. 3. There are exceptions, since the Linear B font by Curtis Clark cannot account for most of ideograms in Linear B, of which there are well over 100. Fortunately, these ideograms, for the most part, occur relatively rarely on the tablets. One notable exception is Pylos Tablet 641-1952 (Ventris), the very first tablet Michael Ventris translated in June & July 1952, on which the ideograms for various types of tripods (ti-ri-po-de) frequently recur. The Curtis Clark font (or for that matter any other Linear B/Mycenaean font) cannot account for ideograms such as these. In cases such as this, you can (if you like) download charts of Linear B ideograms in image formats (e.g. 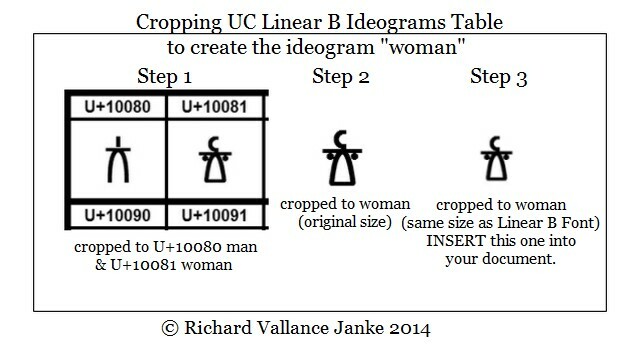 jpeg or PNG), and then crop to the particular ideogram you want to use, resize it to the equivalent of 26 to 28 points, and then insert it into your document at the appropriate position in the Linear B word containing that ideogram, finally switching back to the Linear B font to complete the word. The problem with this, of course, is that it is a time-consuming and awkward procedure. It's up to you. If you have the patience, do it. If you are hosting a Linear B blog, and you want Linear B text to appear professional, you really don't have much of a choice. I don't. 1. Scroll down to the bottom of this page to Friends & Links and then to UCB Linear B Ideograms, and click to see the chart of Linear B ideograms. Click on the chart of ideograms, click again to open it in its full size, and then right click to save it to your computer. Once you have saved the table of ideograms, you then crop down to the particular ideogram you would like to insert in your Linear B text, and save the cropped ideogram to your computer. Good luck! You'll need it. Note that I will be explaining & illustrating the use of Linear B logograms and ideograms (annotated) at Progressive Linear B Lessons, Levels 4 & 5 in the winter & spring (of 2014). 4. When you switch back to your default Latin font to type English (or French, German, Italian etc. Etc.) you of course must downsize the font size back to its default, for instance, Times New Roman or Georgia 10-12 points regular (not BOLD). When you switch to the Linear B font, upsize the font size to a minimum of 26-28 points BOLD. When you switch back to your default Latin font, downsize to 10-12 points regular (not BOLD). Recycle this routine as required.